Adam and Patrick sit down to talk about their upcoming trip to Gen Con 50 while Chris sulks in the corner. 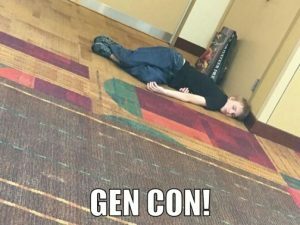 Area of discussion: Gen Con, Planning for Gen Con, Fun Things to do while at Gen Con. Persona 5, Tim Power’s On Stranger Tides, Edgar Cantero‘s Meddling Kids: A Novel, Knifepoint Horror podcast, and Italo Calvino’s Invisible Cities.